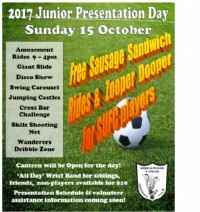 Free Sausage Sandwich, Rides & Zooper Dooper for all SUFC junior players. Canteen will be Open for the day! All players are required to arrive 15 minutes prior to their presentation time to allow sufficient time to organise teams. Coaches, Managers and players are asked to muster in the area beyond the clubhouse on the western side of the netball courts. In the event of inclement weather, the presentations will take place inside the clubhouse. As there are rides in the car park, please arrive early or if possible, walk as parking is limited. During the presentation Coaches and Managers will be able to award special trophies to players of their respective teams. In addition, perpetual trophies will also be awarded. Recipients of these awards will receive the Club’s Perpetual Trophy which will have their name engraved. The recipient will be allowed photo opportunities with this trophy before it is returned on the day to be displayed in the Club’s trophy cabinet. A smaller trophy will be awarded for the player to keep in recognition of receiving the perpetual award.